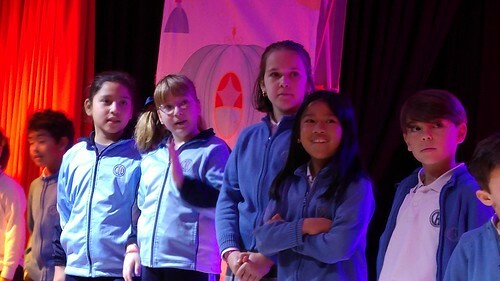 This Monday on February the 15th, 1st, 2nd and 3rd of primary students went to the theatre to see a story called “Once Upon a Time”, by Forum Theatre company. The main character is called Alice; in the story, the old bookshop becomes the best refuge on a boring, grey and rainy afternoon. But she would never have imagined that in this place, full of books, pages and endless shelves, she would have one of the greatest adventures of her life. We liked it a lot. Many of us also had also a chance to go to the stage and help Alice and Michael. When the play finished , we all gave a round of applause to the actors who thanked us.